Thirteen food and lifestyle entrepreneurs from Malawi, South Africa, Zambia and Zimbabwe pitched their business ideas in front of a four-panel jury, potential investors, NGOs and members of the public at Hivos Southern Africa HQ on June 16, 2017. The jury used the following criteria to judge the pitches: strength of the business case, potential for social impact and level of innovation. After each pitch the jury provided feedback to the entrepreneurs. After all entrepreneurs pitched their ideas the jury came to a verdict. Clive Nyapokoto’s Shift Organic Technologies emerged as the Most Innovative Business for his agro-based start-up that built an integrated organic agricultural system that relies on organic waste management techniques. Emma Harvey’s Zambezi Apples emerged as the pitch with a Strong Business Case. From dried pineapple to pineapple juice and water, Zambezi Pineapples is pioneering value addition to pineapples in Zambia. Nonhlanhla Ajaji’s Umgibe Farming emerged as the business with High Social Impact. Umgibe Farming is a carbon-saving, ecological, organic, income generating vegetable growing system which provides a platform to market vegetables grown by grassroots farmers from the underprivileged townships of South Africa. The pitches which followed a two day ideation bootcamp were aimed at enabling entrepreneurs in Southern Africa to scale up their businesses in the food and lifestyle sector. According to leading African entrepreneur and philanthropist, Tony Emelulu, agriculture is arguably the most strategic sector on the continent because: it delivers 2-3 times the return on investment, in terms of improved economic well-being, as other sectors; it represents 32 percent of Africa’s GDP; and it employs 65 percent of the working population. 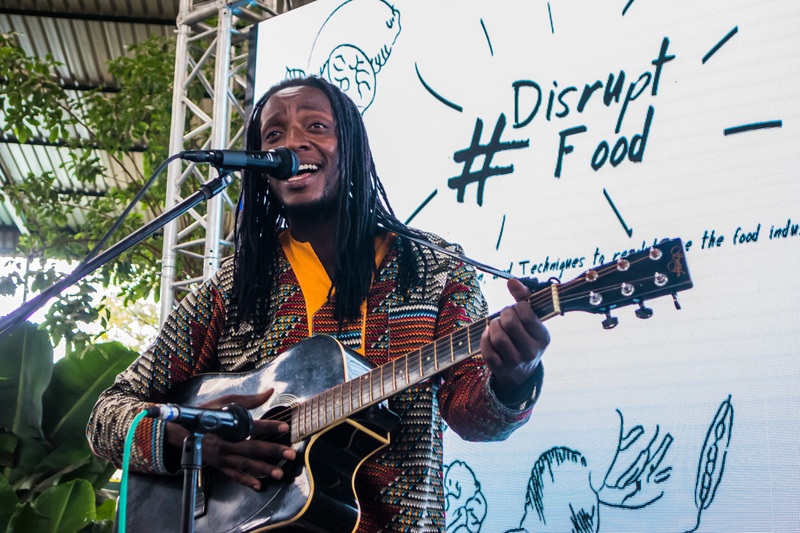 Hivos Southern Africa hosted the pitching competition as part of the launch of the collaboration between Hivos’, Hivos Impact Investments and Welthungerhilfe in the Hivos Food and Lifestyle Fund. The event which was divided into two parts included a boot camp titled #Food Disrupt targeted at food and lifestyle entrepreneurs from Malawi, South Africa, Zambia and Zimbabwe. The second part was the launch of the Hivos Food and Lifestyle Fund which also included a pitching competition for the food and lifestyle entrepreneurs targeted at a wider audience and potential investors. Hivos Impact Investment sets up and manages impact funds and direct investments that align with the humanistic principles of Hivos Foundation in order to support and create more open and green societies. The Investment aims to create impact as well as financial return. Primarily the investment is in social enterprises, typically SMEs and early stage growth start-ups. Cosmetologist and business woman Leticia KudaMupawoseManyepxa is behind the innovation of the product we know as Feso hair follicles renewal. She decided to create this product following her return to her home country and observing that her clients had alopecia problems which originated from poor use of hair chemicals and hair products that destroyed their hair follicles. Feso is a creepy crawling plant and if one grinds it with stones it becomes slimy and foams. TreeCrops has specialized itself since 2004 in the development of supply chains for wild plant and organic products for the food, cosmetic, and pharmaceutical industry. The products are grown and collected by smallholder farmers in rural areas of Malawi. By working with the collectors on a permanent basis they improve their skills and capacity as a means to guarantee supply and quality. They also work with a number of partners on product supply and marketing. MML produces both leaf powder and seed oil for sale in bulk quantities on the international wholesale market. Leaf powder production takes place on site at their farm in the Lower Shire Valley, Malawi, and seed oil is produced in a partnership with local small holders. Residual cake from the seeds is made available on the local market to animal feed processors and farmers. They conducted comprehensive trials in the commercial production of Moringa leaf powder and oil over a number of years. Farmers Basket is a Mobile App created in Zambia to become the global ‘go to place’ for anybody across the agriculture value chain. The app is solving challenges around lack of extension, lack of market information and lack of quality reliable and affordable logistics and has an initial focus on the Southern African region. Sylva Food Solutions trains local farmers on how to dry traditional vegetables hygienically. The final products are then packaged, exported and commercialized to leading supermarkets. Sylva Food Solutions will offer innovative products at affordable prices to the mass market, thus reducing dependency of retailers and consumers on foreign imports. This pure and natural honey is one of the most demanded food-products in the world because of its beneficial capabilities in health, nutrition, pharmacy and general usage. Their bees live in natural forests and in gum tree plantations. They also source raw honey from small scale farmers whom we train and build their capacity of production by providing the equipment. They are also teaching them how to use bees to pollinate crops such as beans and sun flowers as well as fruit trees. At Hutano, they make healthy high-quality and easy to enjoy snacks and porridges that harness the nutritional power of local Zimbabwean ingredients: millet, sorghum, nyimo bean, marula and mongongo nuts, baobab fruit and more. They source direct from small scale farmers and wild harvesters, increasing the value of the traditional foods they already produce while we share the delectable fruits of their labor with a whole new generation of Zimbabwean consumers. Bountiful Foods Brand was started in 2011 and trades under a private limited company that operates as a social for profit enterprise. It’s an ambitious business enterprise driven by the desire to add value to the ordinary indigent horticultural and viticulture products and crops which generally do well with little or no fertilizers. Zim Earthworm Farms (Pvt) Ltd (ZEF) creates value out of waste through cleaning the environment and restoring agricultural productivity using earthworms and other biotechnologies. In short we turn waste into valuable products.